Ape and Creation of Adam. 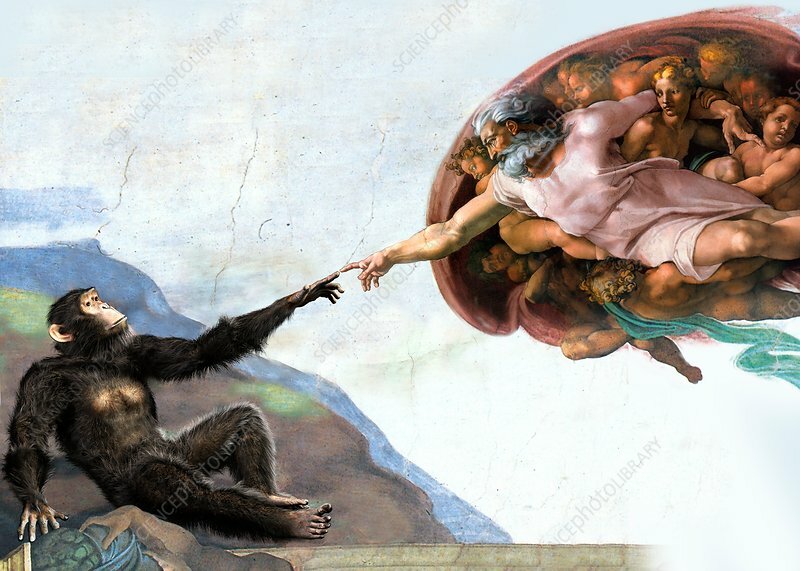 Conceptual illustration of an ape (lower left) replacing Adam in Michelangelo's The Creation of Adam. This painting is on the ceiling of the Sistine Chapel in the Vatican City, Rome, Italy, and represents the story of the creation of Adam by God (upper right) in the Judeo-Christian religion. This replacement of Adam by an ape refers to humans and apes evolving from a common ancestor, as described by Darwin's theory of evolution (published in 1859). This caused a storm of controversy with Christian orthodoxy, as it contradicted the widely accepted belief that different animal and plant species were created by a divine creator (God).